At almost 460 feet high and more than 700,000 square feet, Park Place is the largest leasable office space in B.C. 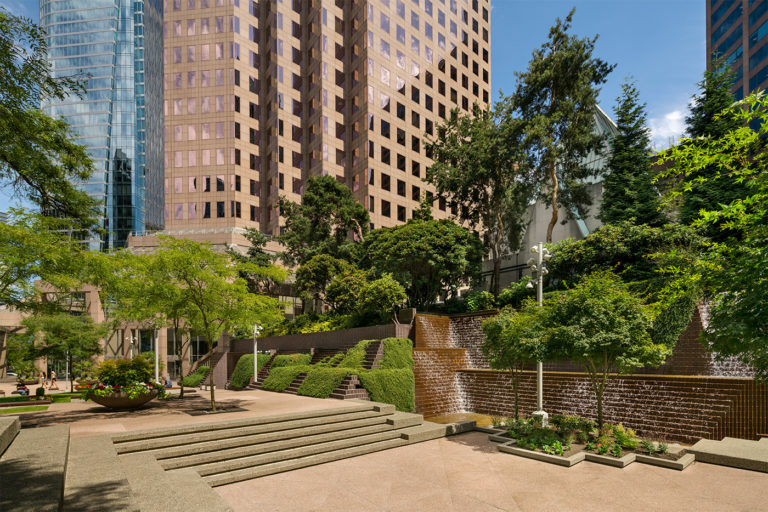 Built in 1984, this iconic AAA office tower in the heart of downtown Vancouver’s business district is well known for its pink granite façade and copper-glazed windows. Park Place is also a clean giant with LEED Gold and BOMA BEST Platinum certifications. In 2018, Park Place was awarded an ENERGY STAR certification, one of the first buildings in Canada to earn this designation. environments that enhance the lives of tenants and guests. Driven by long-term financial and environmental considerations, the property owner has invested in many successful energy retrofit upgrades at Park Place over the years. As part of their ongoing goal to be sustainable, members of the operations team conducted energy studies at the building in 2015. These studies indicated that the property’s energy usage and costs could be further reduced with the installation of a heat recovery system. QuadReal worked with Trane, a manufacturer of heating, ventilation and air conditioning systems, to install a new heat recovery solution at Park Place. Trane enlisted a mechanical consulting firm, SES Consulting, to do the design. SES Consulting proposed two heat recovery chillers that allow waste heat from the cooling systems to be captured and re-used to heat other parts of the building. The heat recovery chillers act as heat pumps to deliver heating, a process that significantly reduces water usage and steam consumption. With the technology installed, it is possible for the entire office building to be heated solely by the heat recovery chillers when outside air temperatures are above 7°C. The new heat recovery system is expected to result in significant energy reduction and cost savings at Park Place for many years to come. The heat recovery system is estimated to reduce Park Place’s annual steam consumption by 80%, with only a 6% increase in electricity, providing an annual energy cost saving of $104,000. The system, together with all other energy conservation projects since 2017, are expected to reduce greenhouse gas emissions by 80% and water consumption by 64%, when compared to 2007 baseline numbers. For QuadReal, the investment in the new heat recovery system makes sense for the sustainability of the property and for the comfort of tenants and guests. It also proves that older buildings can meet or even exceed the performance of new ones. Park Place will be the first property in the QuadReal portfolio to achieve 80% GHG emission reduction from its 2007 baseline. This significant improvement is a result of annual energy reduction targets, new technologies and operational excellence.